There are six species in the genus Chionodoxa. In their native habitats of Crete, West Turkey, and Cypress, these small bulbs grow on mountains and in forests, where they bloom as the last snow melts. The plant is named from the Greek words for snow, chion, and doxa, glory. The star-shaped blue flowers have white centers and appear in racemes of four to twelve flowerheads. Chionodoxa do best in full sunlight, although they can be grown in light shade. They can be grown under deciduous trees because they bloom very early, before the trees leaf out. Glory of the Snow requires even moisture during its growing period. It is dormant during summer head and can withstand drought then. Chionodoxa needs a well-drained soil, preferably a bit gritty. Plant these bulbs about three inches deep in the fall for very early spring bloom. 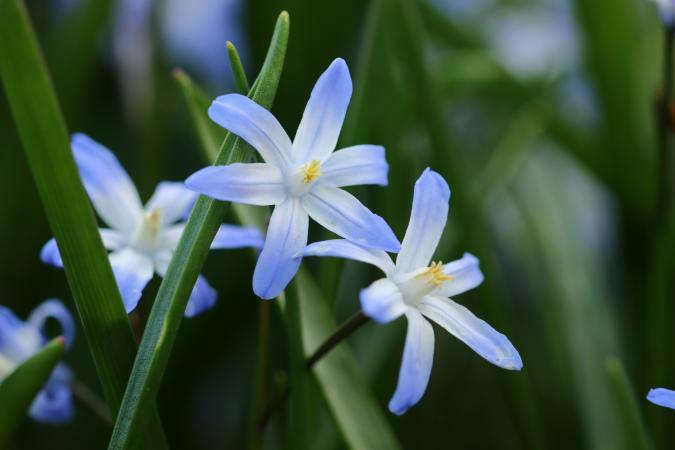 Chionodoxa is very easy to grow. It self-seeds freely and often forms colonies. It can be grown from seed in a cold frame, or from bulb offsets harvested in summer. The foliage dies back and often disappears in summer. Chionodoxa is beautiful in rock gardens or sunny areas of woodland gardens. Like crocus, it can be grown in lawns. It is striking massed under deciduous trees.